The Basin & River Inhabitants Historical Society in a not-for-profit society, founded in 1991, listed in the Nova Scotia Registry of Joint Stocks, and is also a registered charity with Canadian Revenue Agency. The Society owns the former Cleveland United Church in Cleveland , located on the River Inhabitants at junction of Old Route 4, the West Bay Road and County Line Road. The former Cleveland United Church is open to the public in the summer, its distinctive interior is well preserved. The society maintains a modest historical display there and, as well, offers High-Speed Internet with WiFi to the public with Seaside Internet. ​ There is a port-a-potty thanks to Long Point Services of Cleveland. Billy Kehoe of Grantville will show you our display or help you with your internet needs. He returns to St Francis Xavier University in the fall to continue his studies in Philosophy. Sunday, August 20th, 2-4pm rain or shine. BBQ. Bring your Teddy Bear and enjoy a fun-filled event with a brilliant children entertainer. Access to www.ancestry.com can help you with genealogy questions. 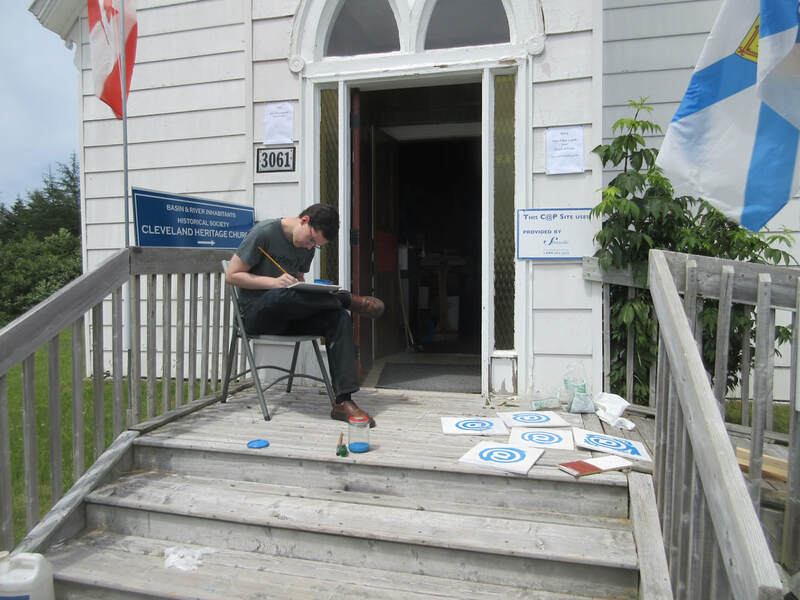 2017 Summer Student Billy Kehoe hard at work at Cleveland Church, Basin River Inhabitants Historical Society, Cleveland, Richmond County, Nova Scotia.